Hair makes your personality. Dry, dull and frenzy hair spoils your look. A proper hair care routine is essential to maintain healthy, beautiful and lustrous hair. Besides so many hair products available in the market; egg is one such naturally available dairy product that plays an important role in adding shine and volume to your hair. Eggs are easily available and can be readily used. 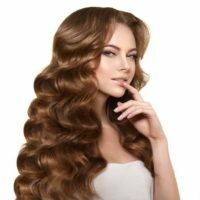 Some unique properties of an egg make it one of the most preferred choices when it comes to treating dry and damaged hair. Egg helps the hair to recreate itself and maintains the texture of your hair. 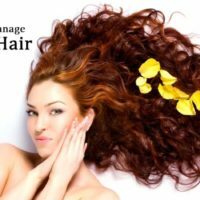 Vitamin A: Is useful to treat hair loss. It also increases the sebum production which in turn makes dry hair oily. Thus, preventing dandruff and thick scalp. Vitamin B: Vitamins of B-group are mostly responsible for increasing the amount of oxygen supply to the hair and improve blood circulation. Vitamin D: It is useful for treating hair loss and promotes hair growth. Vitamin E: This vitamin also increases oxygen absorption. 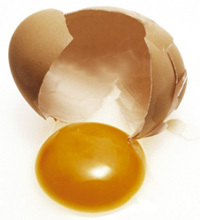 Fatty acids: Besides vitamins, fatty acids present in the egg yolk make hair shiny and manageable. They also fight dandruff, hair loss, psoriasis and flaky scalp, by improving the skin structure. Eggs are highly rich in protein. Protein helps to make the hair follicle stronger making them less likely to break and reduces split ends. Protein in eggs also makes hair thicker making it beneficial for those suffering from hair thinning and lifeless hair. Eggs yolk comes at rescue for your dry, damaged and frizzy hair. Eggs can be used for making some of the best hair conditioners that moisturize dry hair. A raw egg can be used as a great conditioner that turns weak, dull hair into luxurious locks. Take 2-3 eggs and wipe the yolk properly. Massage your hair with it and leave for about half an hour. Shampoo your hair properly followed by vinegar and water rinse. Follow the treatment at-least twice a month for a shiny and smooth hair. Eggs maintain the hair’s natural oils, which shampoo otherwise strips away. Mix 2-3 tbsp of lemon juice to whole egg. 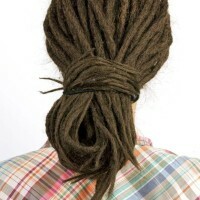 Whisk it properly and leave it on hair for sometime. Rinse it thoroughly. Follow it up with lemon and water rinse. This treatment adds shine to dull hair. Make your own conditioner by mixing two egg yolks with two teaspoons of castor oil. Massage the conditioner on the hair and scalp properly and leave it for sometime. Rinse it properly for beautiful and silky hair. Always rinse your hair with cold water to wash off egg. Cold water not only closes the hair follicle, but it won’t cook the egg as warm or hot water can. Beside adding shine and lustre to hair, eggs are also effective in treating dandruff. 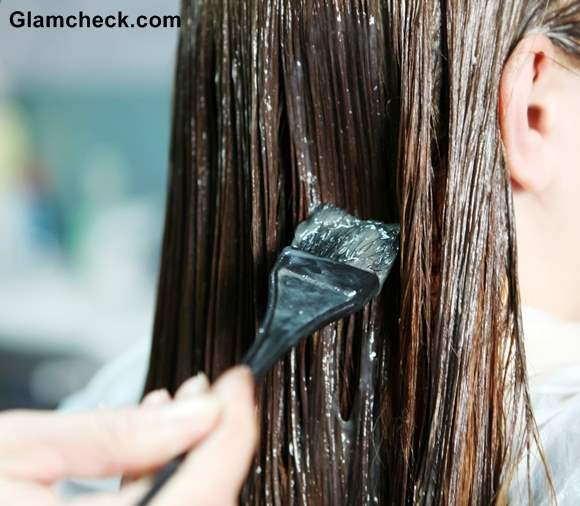 Mix 2 egg yolks in a pinch of baking soda and 1 tbsp of olive oil and massage the scalp properly. Baking soda exfoliates the scalp and the egg yolk and olive oil conditions and heals the hair strands and follicles. Smooth hair looks beautiful and is easier to brush or comb them as they are less likely to become tangled or knotted. You can also have smooth hair following some basic steps. 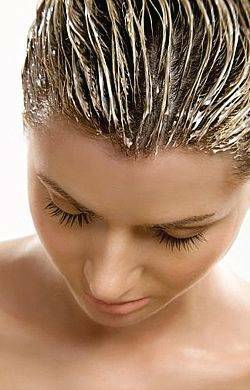 Mix 1tbsp honey, 1 egg yolk, ½ tsp almond oil and 1tsp yoghurt and apply the paste on your hair. Rinse of the paste after ½ hrs for smooth and silky hair. Apply the egg yolk directly on the hair and leave it for about ½ an hour. Rinse it off properly for smooth locks. For damaged hair,apply eggs to your hair three times a week at first and then less often once the quality of your hair has improved. Mix 1 tsp honey with 2 tsp of olive oil and beat in 1 egg yolk. Massage the hair, particularly the tip of the hair properly. Leave the mixture for around15-20. Rinse the hair thoroughly. Egg yolk mixed with lemon juice in another treatment for split ends. Warning: It is advised not use eggs and the mixtures if you are allergic to any of the ingredients.